We are THE NATION'S Leading SUPPLIER OF RECLAIMED STONE. OUR REPUTATION FOR FIRST CLASS QUALITY, SELECTION AND SERVICE HAS MADE US THE TOP CHOICE FOR BOTH PROFESSIONALS AND INDIVIDUALS WHO ARE RESTORING AMERICA'S HISTORIC PROPERTIES, REPLICATING AN ANTIQUE LOOK IN A NEW BUILD, OR EVEN MIXING VINTAGE AND MODERN MATERIALS TO MAKE UNIQUE ARCHITECTURAL STATEMENTS. Were used to paver the driveway of this beautiful estate in Charlottesville, VA.
Chicago Granite Cobblestones were reclaimed from old streets around the city removed to make way for modern paving. While they have the attractive, worn patina antique buffs love, they are no less strong than they were centuries ago or will be for centuries to come. 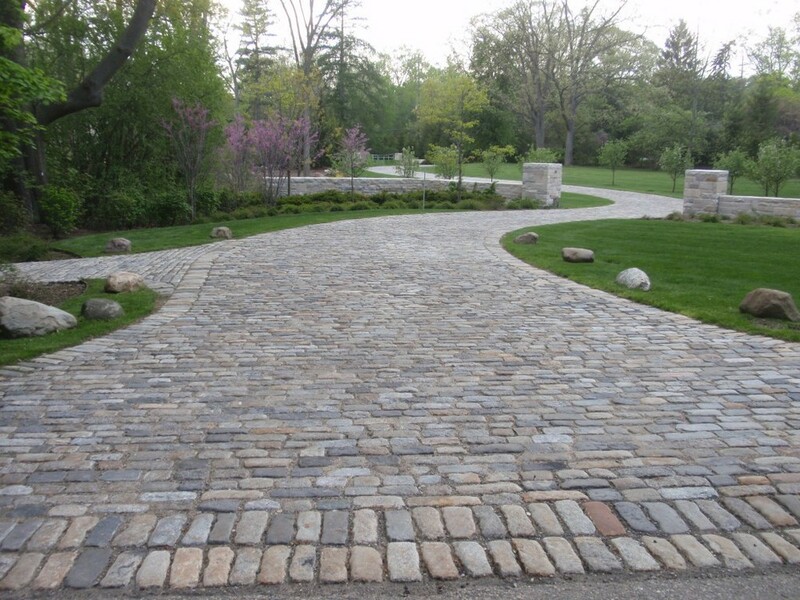 Chicago Cobblestones are easy to work with because their sizes are a little more uniform than our other reclaimed stones. Colors are predominantly soft roses sprinkled with some darks and tans. Philly Granite Cobblestones are true pieces of history, and may even have been walked on by America's founding fathers. Many are so old that at some point in their past they were turned over, so that they now have wear on both sides. Think of it as getting two styling options for the price of one! The Philadelphia Cobblestone base color is a versatile salt and pepper, with lots of tan shades in the mix as well. Choose from standard size or jumbos. Cleveland Red Medina Cobblestones were quarried from sandstone beds in the 19th and early 20th centuries and became a prized building material for their strength, integrity and unparalleled beauty. They were used to build the Brooklyn Bridge, many famed New York City brownstones, the streets of Cleveland, Ohio, and Buffalo, New York, and even went as far as Havana, Cuba. We offer them in earth tones with a gritty worn face and a wide size range for extra character. Pittsburgh Bluestone Cobblestones are the rarest and most exclusive of our reclaimed stone collection. We've never seen the beautiful Pennsylvania bluestone used as paving cobbles anywhere except in the city of Pittsburgh. Indeed, this particular type of sandstone, noted for its blue-grey coloration and decorative veining, is found only in the northern Pennsylvania area. Our reclaimed cobbles feature worn smooth tops for a true antique look.